We are an eminent pipette tips manufacturer and supplier, from India. Our disposable pipette tips are widely used in medical science as well as laboratories. In addition, we also provide plastic pipette tip. 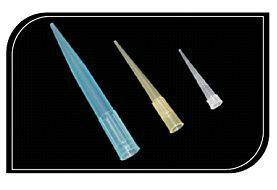 Our pipette tips are made from high purity virgin polypropylene and are designed for use in wide varity to pipetting applications. Suitable for use with instruments from many pipettes manufactures. Tips have clean, hydrophobic surfaces to reduce sample retention and increase accuracy and reproducibility. Tip orifice is precisely centered for directional accuracy. These tubes are Rnase, Dnase & Pyrogen free.